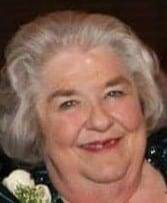 Gloria Jean Peebles, age 72, of Wauseon, passed away unexpectedly in her home on Tuesday, May 15, 2018. Gloria was born in Delta, Ohio on June 21, 1945, the daughter of Blair and Ruby (Steward) Harmon. On December 19, 1970, she married Fred Peebles, and he survives. Gloria loved spending time with her children and grandchildren. Surviving is her husband, Fred; two sons, Clint (Shelley) Peebles of Swanton, Ohio and Fred (Julie) Peebles, Jr. of West Unity, Ohio; and grandchildren, Natalie Walbolt, Taylor Peebles, and Gracelyn Peebles. Visitation and time of sharing will be held from 2:00 P.M. until 5:00 P.M. on Saturday, May 19, 2018, at the Edgar-Grisier Funeral Home in Wauseon. Memorial contributions may be given to the benevolence of the family. Online condolences may be offered to the family at www.grisierfh.com. Be the first to comment on "Gloria Peebles (1945 – 2018)"